Available in elm, a deep wine red and white. Please select when you add to cart. 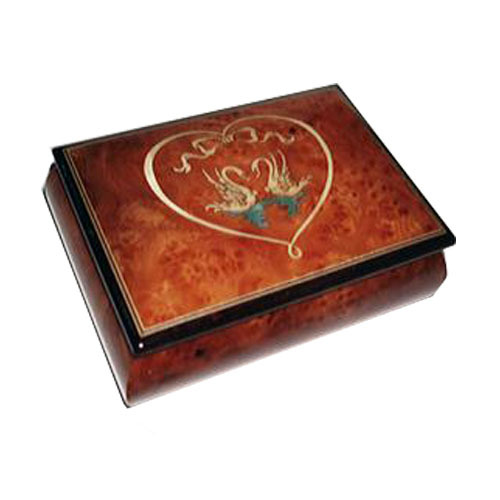 Two swans serenely resting on water, encircled by a heart of ribbon, grace the lid of this romantic music box. 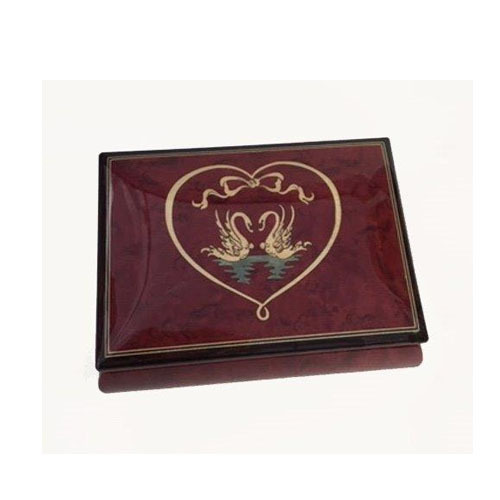 It has a beautiful high-gloss finish and is perfect for Valentine's Day or as an engagement, wedding gift or anniversary gift. It has a beige suede-like lining and a small compartment with a removable ring bar. It measures 5" x 4 " x 2 3/4" as it sits on little brass feet. It plays "Swan Lake" but you may select your favorite tune from our 1.18 Tune List.